1. 3/4″ Hardwood stile and rail doors, mortise and tenon. 2. 3/4″ Hardwood drawer fronts. 3. 3/4″ Face frames with glued and pocket screwed joints. 4. 1/2″ Particle board back with Maple print interior, eliminating the need for hang rails. 5. 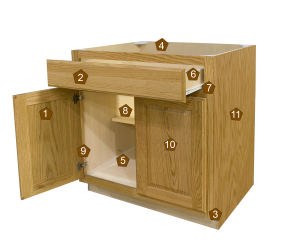 1/2″ Particle board sides, tops and bottoms, with Maple print interior and exterior. 6. 1/2″ Rabbeted plywood drawer with 1/4″ plywood floor, faced with maple print. 1. Solid hardwood dovetail drawer with blumotion full extension under mount soft close drawer guides. 2. Solid hardwood dovetail drawer with soft close 7/8 extension under mount guide. 3. Solid hardwood dovetail drawer with soft 3/4 extension side mount guide. 7. Self-adjusting epoxy coated side mount drawer guides. Track weight rating of 75 lbs. 8. 3/4″ Particle board shelving with Maple print on both sides and one edge. 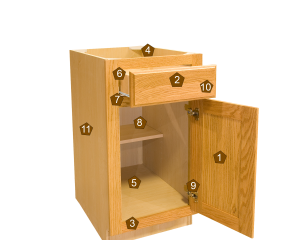 All shelves are adjustable with base cabinets having ½ depth shelves, supported by shelf pegs. 9. Blum one piece adjustable concealed hinges with lifetime warranty. 1. Blumotion soft close hinge. 10. Standard finish consists of hand wiped stain, a coat of self-sealing conversion varnish and a top coat of conversion varnish. Finish thickness approximately 7 MIL, wet. 2. 3/4″ Hardwood drawer faces. 3. 3/4″ Hardwood face frames with glued and pocket screwed joints. 4. 1/2″ Plywood back with Maple print interior, eliminating the need for hang rails. 5. 1/2″ Plywood sides, tops and bottoms, with Maple print interior and exterior. 6. 1/2″ Rabbeted plywood drawer with 1/4″ plywood foor, faced with maple print. 8. 3/4″ Plywood shelving with Maple print on both sides and one edge. All shelves are adjustable with base cabinets having 1/2 depth shelves, supported by shelf pegs. 10. Standard finish consists of hand wiped stain. A coat of self-sealing conversion varnish and a top coat of conversion varnish. Finish thickness approximately 7 MIL, wet. 11. Available option: Applied ¼” veneered skins. 1. Doors will be ¼” Veneered Flat panel doors or 9/16″ veneered raised panel doors with hardwood stiles and rails. 1. Dovetail drawer with side mount 3/4 extension drawer guide. 2. 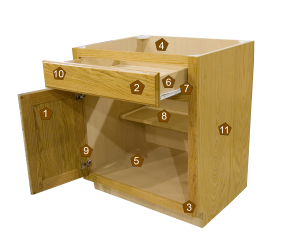 Dovetail drawer guide with soft close under mount 7/8 extension drawer guide. 8. 3/4″ Particle board shelving with Maple print on both sides and one edge. 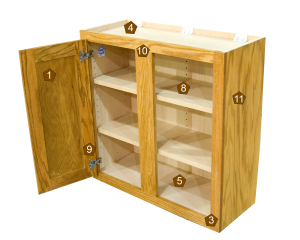 All shelves are adjustable with base cabinets having ½ depth shelves, supported by shelf pegs. varnish. Finish thickness approximately 7 MIL, wet. 11. Unexposed ends will be maple print. *2. Upgrade to: 1/4″ veneered skin is available. *If option one (printed ends) is ordered the entire kitchen will be printed ends.